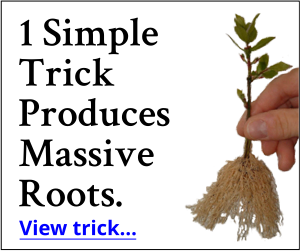 Home » Gardening » How to Grow Tree Seedlings into Beautiful Trees. How to Grow Tree Seedlings into Beautiful Trees. Growing tiny seedlings into beautiful trees isn’t at all difficult if you know what to do. In this post I hope to clear up all the questions that people have. Japanese Red Maple tree seedlings in a bundle. I know they they don’t look like much but these are Japanese maple tree seedlings. Our growers either grow these and sell them as is or they buy them from other growers. There are 20 or 25 Japanese maples in this bundle. I paid about $1.50 each for these. In the Buy/Sell Section of Our Members Area trees like this are available several times a year. In small quantities the cost a little more, but not that much. Japanese Red Maple Trees are Usually Grown as Multi-Stem Trees. If this seems contradictory to what I’ve said about Japanese maple seedlings in the past, that’s because it is. I used to suggest cutting them back as as soon as you get them so they fill out into multi stem trees. But I no longer do that with mine. I just plant them out as is and allow them to start growing. They usually do the multi stem thing on their own without encouragement. Just plant them and allow them to start growing. As they grow trim the tops as needed so they are balanced. It’s really nice if a multi stem tree produces at least three trunks to make for an interesting tree, but that doesn’t always happen. A tree with only two stems is just as nice. You Can Train them Into Single Stem Trees but . . .
Years ago I had a bunch of Japanese Red maples like these in the field and we took a few and trained them into single stem trees. More about that in a minute. When I set them out for sale people grabbed up the multi stem trees first. Apparently that’s how the buying public prefers them. That was years ago and they sold almost instantly for $48.00 each. Back then I buying the seedlings for less than a one dollar each. People love plants and go way out of there way to buy them! Bloodgood Japanese Red Maple waiting to be adopted. As you can see, this Bloodgood Japanese maple is a two stem tree now and looks great. Down the road it may still produce some smaller branches down low. For whatever reason people much prefer this look to a single stem plant. At least with Japanese Red Maples. Orida Nishiki Japanese maple grown as a single stem tree. The Cold Hard Truth about Growing Trees. This is how it’s really done. I buy lots and lots of tree seedlings and grafted trees. I don’t grow them from seed myself nor do I any longer graft my own trees. I’m too impatient, I like to sell my trees sooner, which is pretty much what 90% of nursery growers do. That means that somebody has to be in the business of selling the small trees! But anyway, I plant out a lot of trees, and then as they start growing I prune them according the the path that that seems the best for each individual tree. Some end up as single stem trees, some dual stem, some multi-stem. Looking at the above photo you can see that we had this Orida Nishiki trained to a bamboo stake to get it straight, but it has since out grown the stake and is scheduled to be dug two days from now. As trees like this grow I walk through the field and prune away any branches that are growing out of proportion to the tree, or do not fall within the imaginary line that I have drawn for that particular tree. A video about pruning Japanese maples. Growing Single Stem Trees. How to do it! A bundle of white dogwood tree seedlings. This is a bundle of white dogwood tree seedlings that I purchased from One of My Customers in Our Members Area. Actually I bought a bunch of plants from her. I spent over $500 with just one order. White and pink dogwood trees seem to sell the best when grown as single stem trees. Years ago I had some multi-stem white dogwoods for sale and some single stem white dogwoods and the single stems all sold before the multi-stem. They buying public has a way of telling you what they want! So let’s take a look at how to effectively get nice single stem trees. You have Stake Tree Seedlings So they have Nice, Straight Stems. This tree seedling is off to a good start. Single stem, fairly straight, light branching, main leader is still in charge, it’s doesn’t have other branches competing with it to be the “top dog”. Pretty easy to work with. These are the steps to take with a tree like this. 1. Plant or pot the tree, then stake it to make sure the stem grows straight and doesn’t lean over or hoop over. 2. For now leave all of those lower branches on the tree, they are helping to feed the tree through photosynthesis. Eventually they have to come off, but for now they are small and are doing the tree more good than harm. Do Not Allow them to get larger than 1/2″ in diameter. About the size of a dime. It’s best to remove them before they get that size. When you remove them when small they don’t leave a big scar or stump on the stem of the tree. As the tree starts to make more branches and leaves up top you can remove the branches from down below, larger ones first. 3. When the tree reaches the height where you actually want the permanent branches to start, simply cut off the top of the main leader. This will stop it from growing upright and will cause the tree to set multiple buds right below where you make this cut. Those buds will develop into branches. 4. As the top of the tree starts to develop be sure to remove all of the branches on the main stem where you do not want branches. 5. Now your little tree is starting to look like a tree. Trim the top branches as need to keep the tree balanced and light pruning of all of the lateral branches will force more new growth making the tree nice and tight which makes for a desirable tree. This movie explains some of the reasoning about pruning. But what if the seedlings you have are not off to a great start like the one shown above? Yeah. That’s a problem. Like this scary looking seedling. A tree seedling with multiple leaders. Ignore the roots! We’re only talking about the branching of this tree. I dug this thing out of the woods only for the purpose of demonstration and it went into the brush pile as soon as we took these photos. Sometimes the terminal bud on a tree seedling gets damaged and causes the tree to set multiple buds just below the damaged bud. Those multiple buds result in multiple leaders. That is a problem that has to be corrected as soon as you see it happening. This little tree has two leaders now and it appears that there is a third one that is also going to take a stab at being in charge. Training a tree seedling to be a beautiful tree. First thing we are doing is removing the competing leader. Examine the tree seedling, decide which leader is the best candidate to be the main leader, then remove the competitor or competitors. In this case we are only going to remove the one at this time and we’ll leave the smaller, lower branch so it can help feed the tree as this little seedling finds it’s way. But that smaller branch will have go sometime in the next 12 months. If you look at the very tip of this main leader there is something going on there that might result in more multiple leaders up there. This is something to be watched and if a problem develops, again we’ll make sure we end up with only one main leader. Our goal is one nice, straight stem. From this point we will follow steps one through five outlined above to produce a beautiful tree. You’d be amazed a how nice this tree will be in a few years when staked and trimmed properly. Our Members Area is Amazing! You won’t believe the deals on plants that are offered every single day, not to mention the wealth of information and help you can get at just about any hour of the day. Or the middle of the night for that matter! Hey! Will You Do Me a Favor? I hope you’ve enjoyed this post. I took about three hours out of my Sunday, not to mention the time it took to get the photos to do this post and I’m asking you do me the favor of sharing this with your friends via Email and Facebook. I truly would appreciate that! Thank you! 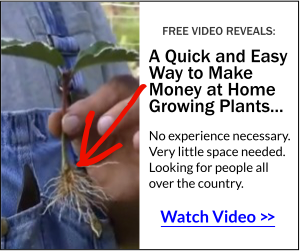 Get Paid for Growing Small Plants like this At Home! It’s Fun, it’s Easy and You Can Do it in a Really Small Area. Questions and comments are always welcome, just post them below and I’ll check back! I have about 6 Japanese Maple seedlings that I saved from the lawn early this Spring. They are each in their own pot and seem to be doing good. The biggest is maybe 4″ tall now. I’m keeping the pots under the big tree where they receive filtered sun and rain. What do I do with them come the end of the summer into fall and then this coming winter? I feel they are too small to put in the ground. They’d probably be happiest and safest in the ground. That’s how they grow naturally. We have a Weeping Japanese Maple that has been left not pruned for many years. The back side has been shaded out and some of it has died, which I will cut away. Also, the shade is being slowly remedied so I don’t think I want to move the tree as it’s in a nice spot. But, as far as pruning the rest of the tree… do I need to do this slowly, taking it back just a bit each year, or can I go ahead and take it back to shape it back up? This time of year you should be able to trim your Japanese maple pretty aggressively and it should be fine. Yes, the tree will fill out nicely if topped. We live in NC and it is now the end of July. Last year I planted 3 Granny Smith apple seeds and they all came up (much to everyone’s surprise). They are currently in separate large containers and I figure they needed moving to a more permanent place earlier this year. We just didn’t have the land cleared at the time and the little things had already leafed out. Would it be o.k. to move them now or what should we do? Also thank you for the great video and info about growing red maples from seeds. I am looking forward to getting some started! As long as you can slide them out of the container without doing any serious root damage, and you should be able to, they should be fine to plant now. Just water as needed. I have an Ash that has a seedling in the mulch bed surrounding the trunk. . Is it possible to save this seedling & transplant it to another location. I am guessing the fall before frost(?) If it can be saved, what is the proper way to plant. You see, I’m not the best when it comes to a “green thumb”. Yes you can save the seedling, but the ideal time to move it would be after a hard freeze when the seedling is completely dormant. Just tie a ribbon on it so you see it and remember after the leaves are gone. Hey Mike, I just got a bunch of maple seedlings and can’t get them in the ground yet as we are getting a lot of rain and supposed to rain all week. What is the best way to store them in the meantime. Put them all in a large nursery container and cover the roots with soil. Make sure there are no air pockets around the roots. I just transplanted a one year old Japanese maple seedling into a bigger pot, but I accidentally broke the main leader branch off. It still has another branch, but I was wondering if the seedling will still survive and if there was anything I could do to help it survive. Plants are a lot more resilient than you think. I’m sure it will be just fine and there’s really nothing that needs to be done. It will heal on it’s own. Wow, Im losin it, sorry it’s January in NC now. I dont know where nov. came from,lol. Hi Mike, I am so glad you are here to answer questions 🙂 I just joined the Arbor day society and they sent me my 10 free trees. There roots are tiny and Im not sure if it would be best to plant them in the ground outside now or put them in pots. Also, it is November in N.C. Im by New Bern and it is so fluctuating, I dont want to kill the poor lit’l things. Wondering if you could give me some advice? ?I got regular dogwood and japenese dogwood, also dont know if they need anything special. So, any suggestions would sure be appreciated. Thanks Oh and, My husband and I have been busy all summer getting our cuttings and they are doing great, so thank you for all your help. We are so excited for spring, it will be our first year trying to see if we can make a backyard nursery happen. Well, thanks for all your help, look foward to hearing from you. Wishing you and your family : Merry Christmas and a Very Happy and Healthy New Year. Plant those trees in your garden and just leave them there for at least one growing season or longer. Just keep in mind that once planted you cannot move them during the growing season. You can safely dig them from late Nov through Feb. Once they leaf out digging them is out of the question. Thanks for your good advices. I have a question. I started 2 tropical fruit trees from seeds, one is about 10″ and the other 16″ high now. One is “Pitanga” (Eugenia uniflora) and the other is “Acerola” (Malpighia emarginata). The winters here are too cold to have this trees outsides, so I would like to transplant them to 15 gallon buckets and keep them small so I can store then in the basement during winter time. How can I keep this trees like miniatures (not exactly bonsai) so that they not grow more than 4.5 feet high? I live in Charlotte, NC. There are many “volunteer” willow oak and tulip trees in the yard. I have been letting them grow in ground. I have one of each already grown into large trees. How do I locate a market for these trees? Thank you very, very much for this, and ALL of your help! I only share marketing information with those who have my system. The marketing methods that we use work incredibly well. Mike, can you tell where i can get Chinese dogwood seedlings about 200. I purchased your DVD a couple of years ago and just now using the system. any help would be great! Charles, you have to refer to the wholesale directory, I can’t post sources here on the web. my husband and I have been thinking of growing plants/trees on our property from seedlings to sell in the future. I have no idea where to start or where to buy the seedlings, i am especially interested in the feather leaf Japanese Maples. How do I go about finding where to buy seedlings? I really enjoy your videos, they are so informative. All of that information is included in my system, http://freeplants.com/wanted.htm. I don’t share it with non customers. I understand your position on always getting plants that have both their common name and Latin name to be able to identify the plant. I live in northeast Michigan with some acreage for my back yard. This property is primarily in native trees. I have several Eastern White Pine which were/are native to this part of the state. As a result there are numerous white pine seedlings sprouting near these mature white pine trees. My question is this. Are there other forms of white pines that could be confused with the Easter White Pine or can these seedlings be transplanted and potted for sale? or more deer in Ohio as we do here in central NY. Mike, I have a big row of Oleanders and I would like to cut them back. When is a good time (Central Texas) to prune and how much can be done? I love your emails and have tried some of your video examples. Love the illustrations. Ideally? Right before winter would be the ideal time to do that kind of pruning. PS I also have hopes of purchasing this fall and being in my own home and ground. It’s great to have you aboard! Have fun, you are going to enjoy this. Mike, great information on your site! One question. Does your growing system include contacts in Canada? Or is it just US? We do have some Canadian contacts in the wholesale directory. Mike, although I don’t comment often, i would like to thank you for each of the posts you take the time to write and post. Each of them are read eagerly, and oftentimes more than once. Thank you. Thank you, I truly appreciate your kind of support. It really is time consuming and often taxing to get all of this done. That’s why I often do them on Sunday, sometimes it’s the only time that I can find the time. I have a weeping cherry that I really don’t know how to prune. Some new growth grows to the ground. Some new growth comes out of the top. It’s about 10 years old and I prune by reshaping the tree, but I don’t know what I’m supposed to be pruning. Can you offer me any advice or maybe do a video on pruning full grown trees? Sue, The growth that is hanging down can just be pruned to any length you desire. The growth growing out the top is a big problem and near the end of this video http://japanesemaplelovers.com/one-finger-pruning/ I show you exactly what I mean on a weeping cherry. I learned so much watching your video. You have inspired me!! Not on a big scale though. I am too old and inhibited with COPD and arthritis so much that I can’t do much any more. However I have wanted a Dogwood tree in my bird sanctuary ever since I moved from CA to GA. That was about 8 years ago. Can’t save enough money to buy one. (They are really expensive, Several people close to me have one. I would like to know how to start and care for one from seed or a sucker. Is this possible and where can I find out how to do it? Does the tree actually produce seeds? what time of year? They are just starting to flower now. Any advice you give me will be taken very seriously as I have been receiving your newsletter for several years now. My hubby has used a lot of your information to a good end. So I have a lot of faith in your teachings. Good post. I’m getting a lot of volunteer seedlings of dogwood, Japanese maple and golden-rain. Should i just leave them in the ground or pot them up? Either way works. If you are do dig them, do it while they are dormant and make sure you use good potting soil. I just did a post about that on this site. Mike is very down to earth. With great communication skills he’s a natural teacher w years of experience and expertise. His materials are simple and keep extraneous info to a minimum. I enjoy emails. Books videos and his blog. I feel as if I have spent time with a favorite uncle at the farm. Maybe it’s the bibs. First,thank you for the very detailed instructions. I still have one question regarding small trees like this one.I got few trees and they are single stem. One or two came came with the top 1 inch broken and dry. Can I just trim that off? Will the trimming them now ( they are about 1f high from the ground) prevent the growth? I would appreciate any feedback on this. You really don’t have any choice but to trim them. That is going to create multiple leaders but in this post I explain how to deal with that. I have one question is it better to let my tree seedling grow in pots or should I put them in the ground? If you are really good at growing things in pots, then pots are fine. But if you don’t have good potting soil and a good means of fertilizing them, then in the ground is better. Container growing is great, but at first it’s a bit tricky. That’s an interesting product but I’ve not tried them or looked at them really closely. I need to do that! Thanks for the response. Right now I have about 100 japanese maples growing in pots. Im using a low nitrogen fertilizer from happy frog, and a 60/20/20 mix of pine bark/perlite/peat. I enjoy reading all about your gardening advice. I live in Florida From September or October until the end of April or beginning of May. Do you have any suggestions on what kind of tree to plant on a small sunny lot in front of a home in area 9 0r 10? When giving your planting advice, could you mention in which area planting code would be best?